After that last post I thought it'd be nice to share a video of the shrimp just chilling out enjoying their home in the tank. One of the shrimp was found dead this evening. [Note: I wrote this on April 27, but didn't hit publish till morning] He was sitting on top of a pile of blue-green algae (cyanobacteria) on top of the substrate (aquarium soil, specifically Fluval Stratum) He was pale compared to the others but not clear like an empty molt. I sat watching him for quite a while noting that he didn't seem to be moving at all. Not a leg moved, not a twitch of an antenna. I reached in after a while with a long pair of tweezers and disturbed the cyanobacteria covered substrate, and the shrimp didn't move. I watched him for a while longer and one of the others came over and nudged him, he fell over on his side, I watched a while longer and he didn't move. He was dead. The Blue Velvets have gotten pretty comfy with their new home. These little guys are really good at hide and seek, (well the hide part anyway), even without any predators in the tank with them. Any time I've tried to do a head count the best I can get is 7 velvets and the cherry. No signs of any of them being ill or falling dead, so I think everything is going well. It's becoming more apparent which are the females now. None are berried (carrying eggs under her belly) yet, but there are a few that definitely have the mature female trait of the yellow saddle (ovaries). Well, I guess I missed the Crystal Black sale, so I decided to go with a group of 10 Blue Velvet Neocaridina shrimp. Here they are in the bag from the store getting used to the tank temperature. And finally in the tank, getting used to their new home. Unfortunately one of the 10 didn't survive.They were all fine when we got home, but after a little while of being in the bag, with everyone piling in the corner trying to get the 2 little daphnia?? that were in with them, one of the shrimp was dead when I went to transfer them. Unfortunately, I didn't notice the dead shrimp until after they had been transferred out of the bag. 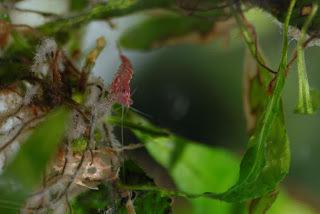 I knew before I started that cherry shrimp do change their colour from different amounts of red colouring to fairly clear (and the reverse) depending on food, stress, camouflaging, how young they are, and who knows what other variables might come into play. What I did not expect to see was how much change can happen even in a few hours. I only have the one shrimp right now (and it's in a little fish bowl, so I know that there are not 2 of them hiding out in that little space, there's definitely only the one. but I can look at him mid-day and he'll be grazing away and looking quite red. A few hours later I'll have trouble spotting him because his colour has almost completely drained. Here are some photos of my first shrimp. He (she?) was a stowaway on a large java fern that we got from one of Anna's coworkers. I know there's at least one other stowaway in that plant somewhere, but I can't find her. I know I poured 2 live shrimps out of the bag the fern was transported in into the 10 gallon tank that currently houses the fern (and is almost completely filled by it!) while we replace the floor in the recroom and get the 65 gallon tank set up. I've only managed to find this one again and move him to a fish bowl where I can keep an eye on him while the shrimp tank finishes cycling. And a video of him the first night I had him in the bowl. Ok, so my wife said a couple of months ago that she wanted an aquarium (or maybe it was a fish). I wanted to not kill a fish, so I started learning all I can about aquariums. In the process I discovered freshwater dwarf shrimps and I think that they are super cool. 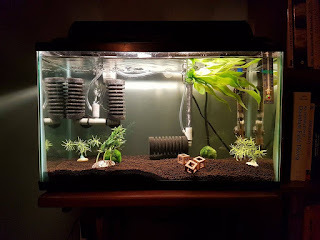 So, after we got the Betta tank set up, and I put out an ad on Kijiji (the Canadian equivalent of Craig's List) looking for whatever free aquarium equipment I could scrounge for a bigger planted tank that she wanted to put together, I started thinking about a small shrimp tank of my own. I ended up gathering a lot of cool free stuff from local aquarists who were downsizing, or getting rid of things they no longer wanted. In fact, other than the heater and live marimo moss balls, everything in the shrimp tank so far was free. I highly recommend this route as a great way to get started. On April 1, 2017 I set up a 10 gallon shrimp tank and started cycling it. Here is a photo from that first weekend.